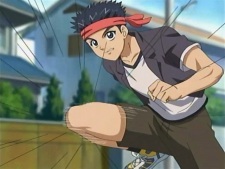 Kouga Taichi, also known as Kouga the Kicker, was part of the Techniques Trio along with Takeda Ikki and Ukita Kouzou in Ragnarok and the only one out of the three that did not join Shinpaku Alliance. Kouga is a young man of average height with short dark hair and wears a headband on his head. He wears a white shirt with an open blue shirt over it and shorts with pockets. He's also shown to have a bit of a feminine look. He also wears a long earrings on his left ear. In the anime, he is much shorter than he is in the manga. Unlike Takeda and Ukita, he seems to bear hateful grudges against Kenichi, who he plans to take down himself, and Miu, whom he calls "Neko Shojo" (Cat Girl). He never truly cared for Takeda or Ukita and was fine with beating them up for their betrayal. Though he is a strong fighter, he possesses a carefree attitude, which usually earns him a beating from Kisara. He is very loyal to Ragnarok and is always eager to deliver punishments to those who betray the gang. He can even be seen as ruthless and somewhat sadistic, as he had planned to break Ukita's arm by jumping and snapping it in two with a falling-axe kick but thankfully he was thwarted. Even some of his men thought that was a little too much but Kouga wanted to do it cause Ukita threw him into garbage and thought it would be fun. Kouga is first shown when Takeda showed his desire to fight Kenichi. When Kenichi and Miu were walking home from shopping, Kouga and his gang ran into them and prepared to fight them. He showed an interest in Miu, but once she beat all of his men and kicked him, he grew to develop a grudge against him. Kenichi would then fight him and deliver a shallow punch on his chin and cause him to lose his balance which defeated him. He later appeared to give Takeda his farewell beating for leaving Ragnarok and was shocked that Ukita betrayed them and sided with Takeda by throwing Kouga in the trash. When Ukita was caught, he planned to jump up and break his arm despite the others protests, but was thwarted by Kenichi's punch in the back. The next day, he laughed at Kisara's loss against Miu. He traveled with Kisara to ruin Miu's play, but when Kenichi showed up and stopped them, Kouga was again defeated by Kenichi. When Kisara's gang joined Shinpaku, Kouga was forced to get along with the other members of the alliance. However, he was actually a double agent for Loki and when he tried to give Niijima some soda with laxatives in it, Niijima saw through this and forced Kouga to drink it and he ran away needing a bathroom. His current whereabouts are unknown, but with Ragnarok disbanded, it's likely he now is still a thug or forced to go back to school.